Sabbath School is the weekly Study Time for all ages where we can learn about Jesus and His love through Bible study, mission emphasis, fellowship and outreach activities. Adult Classes There are 2 adult classes. One meets in the sanctuary, the other in the Fellowship Hall. 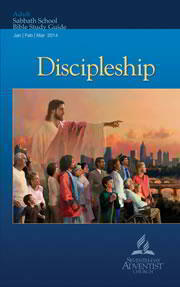 The topic of our quarter is discipleship. Though the term has many facets, in this study we will look at discipleship as the process by which we become followers of Jesus and, as such, better soul-winners. After all, Jesus is every Christian’s example, especially in the work of soul-winning. Is it illogical to suppose that the keys to effective evangelism are discovered in popular psychology, mass-marketing techniques, and elaborate promotional programs rather than in the following of the simple example of Christ? How did Jesus attract His followers? What can we learn from Christ’s example that would enable us to more effectively lead others to Him? How can we fulfill the Great Commission? Copyright © 2019 Holly Church.